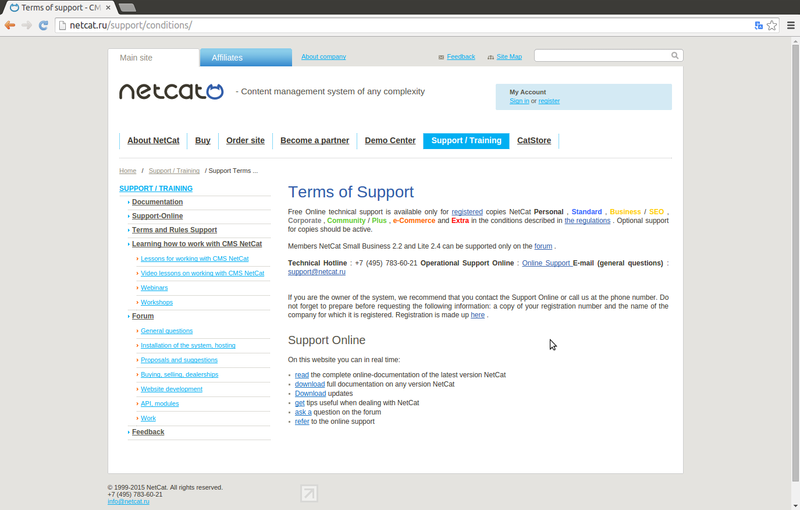 NetCat.ru is russian local company. “NetCat designed to create an absolute majority of the types of sites: from simple “business card" with a minimum content to complex web-based systems, from corporate offices to online stores, libraries or media data – in other words, projects completely different directions and at any level of complexity. View examples of sites running on NetCat CMS can be in a special section." “Manage the site on the basis of NetCat can even inexperienced user, because it does not require knowledge of Internet technologies, programming and markup languages. NetCat constantly improving, adds new features. In the process of finalizing necessarily take into account the wishes of our partners and clients, as well as trends in Internet development. More than 2,000 studios and private web developers have chosen for their projects is NetCat, and in 2013 sites, successfully working on our CMS, created more than 18,000." Several NetCat products 0-day vulnerabilities have been found by some other bug hunter researchers before. NetCat has patched some of them. Web Security Watch is an aggregator of security reports coming from various sources. It aims to provide a single point of tracking for all publicly disclosed security issues that matter. “Its unique tagging system enables you to see a relevant set of tags associated with each security alert for a quick overview of the affected products. What’s more, you can now subscribe to an RSS feed containing the specific tags that you are interested in – you will then only receive alerts related to those tags." It has published suggestions, advisories, solutions details related to cyber security vulnerabilities. (2.1) The programming code flaw occurs at “/catalog/search.php?" page with “&q" parameter.